Does your living room look like a warehouse for audio/visual equipment? An entertainment center will house your television set, VCR, stereo system and gaming console in one space-saving place. These custom wall units are specifically designed for this electronic gear. They also provide storage for videotapes, compact discs, cassettes, game cartridges and even your old LPs. On the outside, entertainment centers closely resemble other wall units. Their deep base cabinets have doors or drawers, or both, and are topped with open shelving units. 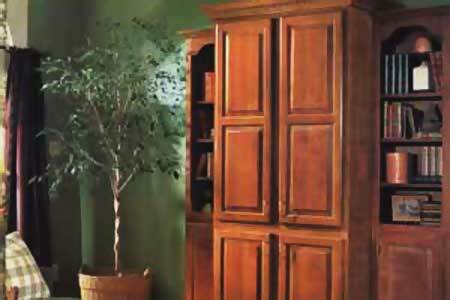 The middle cabinet typically houses a TV, so it's much wider and deeper than the shelving units that flank it. Inside, however, you'll find a variety of specialized features. For example, rollout shelves provide easy access to individual electronic components, while adjustable drawer dividers neatly store tapes and CDs. Most also feature slide-back doors that allow an unobstructed view of the TV. Here's how to build your own custom unit using stock cabinets. Remove the baseboard molding from the wall where the entertainment center will go. 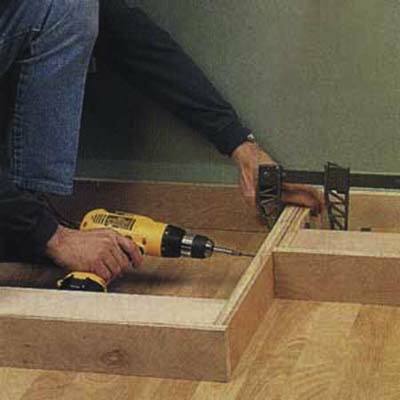 Then install a 3½-inch-high platform (also called a toekick) for the cabinets to sit on. 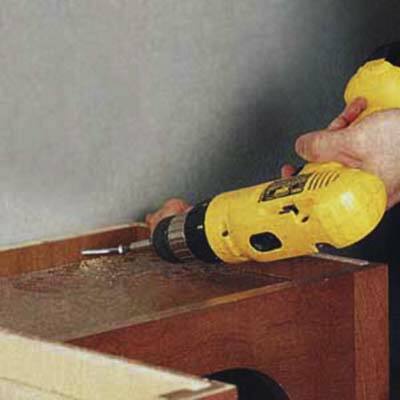 Build the platform out of 2x4s; fasten the parts together with 3-inch drywall screws. Saw off the toekick from the bottom of the large utility cabinet. 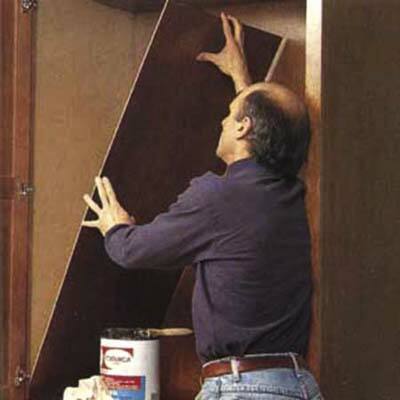 Flip the cabinet upside down so its larger compartment is on top for the TV, then set it onto the center of the platform. 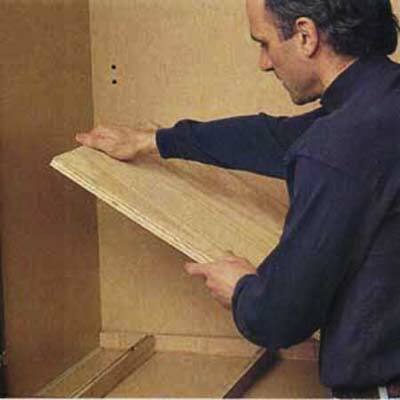 Next, build up the height of the shelf so its inside surface is flush with the face frame to make sliding in the TV easy: Cut four or five narrow plywood strips and lay them equally spaced across the shelf. Then cut a 3/4-in. plywood panel to fit over the strips. 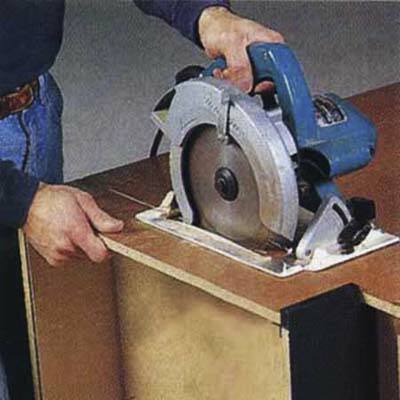 Once you've built up the shelf, cut prefinished plywood skins for the interior surfaces of the compartment. Glue the skins in place with contact cement starting with the one that covers the inside top of the cabinet. Then install the skin along the back, followed by the left- and right-side pieces. 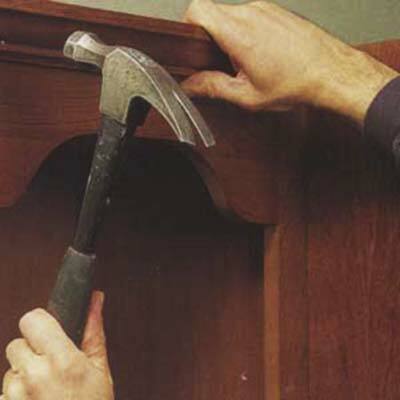 Clamp a bookcase unit to a wall cabinet and join the two with a pair of 2½-inch screws driven through the face frames. Spread out a blanket or moving pad and lay the assembled unit on its side. Cut a plywood skin to span across both cabinets and glue it down with contact cement. Repeat this step for the other bookcase. Next, place the two assembled bookcase units onto the platform and screw them to the middle TV cabinet. Again, drive the screws through the face frames. Also screw down through the bottom of each base cabinet into the platform below. 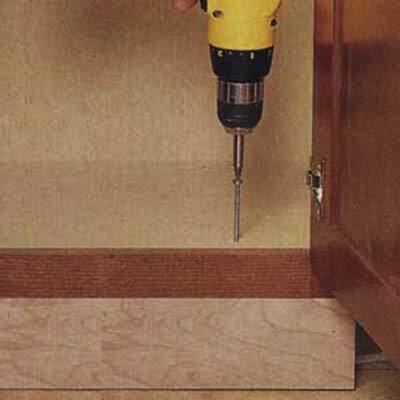 For added stability, and to prevent the cabinets from tipping forward, drive a 3-inch screw through the top-rear of each cabinet into a wall stud. 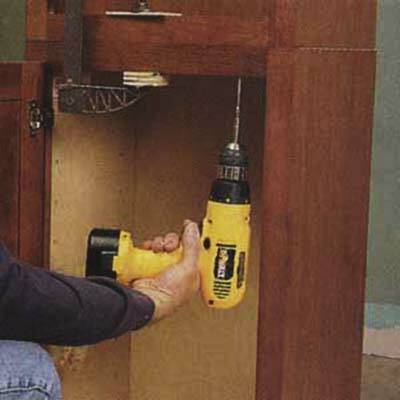 Be sure that each screw is driven into solid wood, not just wallboard or plaster. 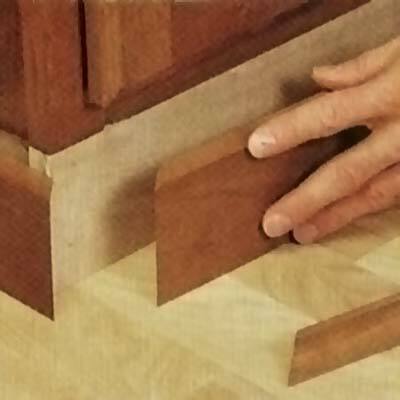 If necessary, slip shims behind the cabinets to keep them plumb (perfectly vertical). 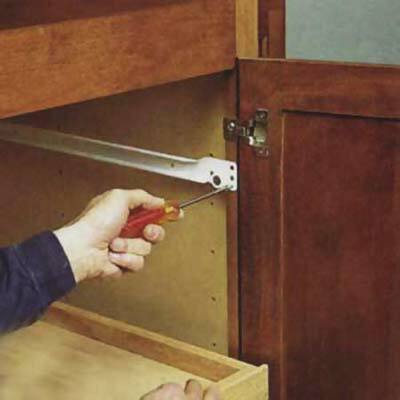 Once all the cabinets are securely fastened, install the specialty hardware and decorative trim. 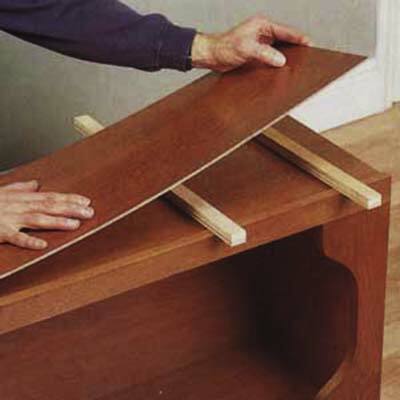 Start by screwing the metal tracks that support the rollout shelves into the bottom half of the TV cabinet. Note that the front end of each track is fastened to the edge of the cabinet face frame. Next, conceal the exposed platform around the bottom of the cabinets with baseboard molding, available prefinished from the cabinet manufacturer to match the cabinets. To install the prefinished crown molding—also available from the manufacturer— first nail 3/4 x 1-inch wood strips to the tops of the cabinets. Then nail the crown molding to the strips with 1½-inch (4d) finishing nails. Finish up by cutting the old baseboard molding to fit along the wall.